Alyxandra Harvey reveals our uncertainty about the future of vegetation and food in her post-apocalyptic story “Green Jack”. After crops begin to fail on a regular basis and the weather becomes unstable, a city tries to survive by perpetuating the same behaviours that endangered its vegetative life in the first place. Government and industrial regulations control the vegetative world, constraining and controlling plant life to human will, harnessing it exclusively for human purposes. Instead of allowing biodiversity to flourish, the city begins to kidnap Green Jacks, figures who are linked to the vegetative health of the world and who bring growth and fertility in their wake. Instead of allowing for the freedom of plant growth, these Green Jacks are abducted by the city, controlled and regulated, their power drained to fuel an industrial complex focused on human interests. Walls are erected around the city to tightly control the population and provide the image of security while all securities and choices are removed from the populace. Harvey explores the atrocities that can be committed on a population’s behalf when they are starving and examines the coercive power of hunger. People willingly give up their freedoms for the perceived protection from hunger provided by a society that tightly regulates food. 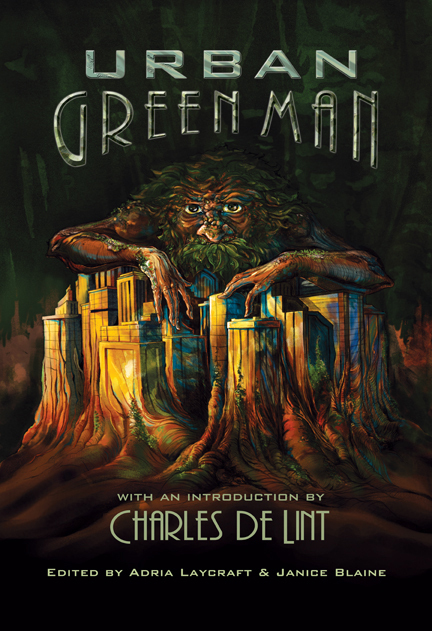 When the protagonist steals a Green Jack’s mask in an attempt to gather enough food for herself (since the mask fuels growth of food) she becomes a target for the military and this mask brings with it either the potential to free her from the tight regulations of the city and allow for free growth or to become the subject of incarceration and control. Alyxandra Harvey explores urban uses of population control and the danger that hunger poses for policing people’s actions. Much as the tight regulations of the city control vegetation and bring it under government will, so too the people are regulated, denied freedom of growth and become stagnated under imposed control. To find out more about Alyxandra Harvey, you can visit her website at http://alyxandraharvey.com/ . To read more stories from Urban Green Man, visit their website at http://www.urbangreenman.com/ . This entry was posted in Fiction Book Reviews and tagged Alyxandra Harvey, Edge, Food, government control, Green Man, hunger, reviews.